Here are a couple of questions for you. 1. What is the name of Berlin Tegel Airport? 2. Which brothers were the first ever aviators? The hundreds of people who fly into Berlin Tegal airport every day are probably unaware that the airport is actually named 'Berlin Tegel Otto Lilienthal Airport'. And why should they? Liverpool John Lennon Airport ('Above us only sky'), has a 7ft 6" statue of the scouser singer-songwriter greeting visitors to Speke. In comparison, Berlin Tegal has a bronze statue of a rather frustrated-looking guy in goggles sprawling on the ground wearing a pair of flimsy artificial bird's wings (The Fall of Daedalus and Icarus by Rolf Scholz). It is not the kind of sculpture to inspire a confidence in flying. This sculpture is supposed to represent Otto Lilienthal, who in 1889 had his massively influential book Der Vogelflug als Grundlage der Fliegekunst (Bird-flight as the basis of Aviation) published, and began his own experiments of strapping imitation bird wings to his arms and leaping off of high places. Otto decided that actually, if you wanted to achieve heavier-than-air flight, imitating bird-flight wasn't the way to go. Together with his brother Gustav, Otto began developing fixed-wing gliders. And so the answer to the second question is: Otto and Gustav Lilienthal. Not, as you might have thought, Orville and Wilbur Wright. Note that I didn't say powered flight.Otto and Gustav pioneered the development of glider flight (mainly led by Otto - hence he gets all the fame), making 2,000 flights between them from 1891 to 1896, and notching up five hours total flying time. (I also specifically said 'aviators' in the question, to eliminate e.g. the ballooning Montgolfier brothers). Otto's last flight was 9th August 1986, when he tragically crashed his glider from a height of 15m (50ft) and fractured his neck. Otto died the next day from his injuries, aged 48. The achievements of the Lilienthal brothers were a major inspiration for the Wright brothers; they read Otto's book Birdflight as the Basis for Aviation, poured over photos of the Lilienthals' gliders, and they used Otto's published data on wing-lift and wing designs to inform their own work. The Wright brother's first successful powered flight at Kitty Hawk was on 17th December 1903, just seven years after Otto's last.In September 1909 OrvilleWright was giving demonstration flights at Berlin's Tempelhof Airfield. 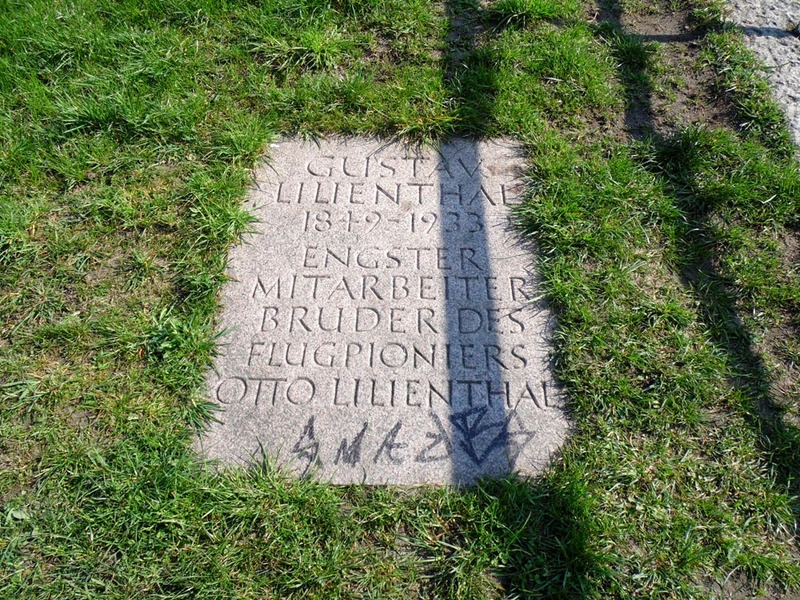 He paid a visit to Otto Lilienthal's widow Agnes and conveyed his and his brother's indebtedness to Otto for his inspiration. 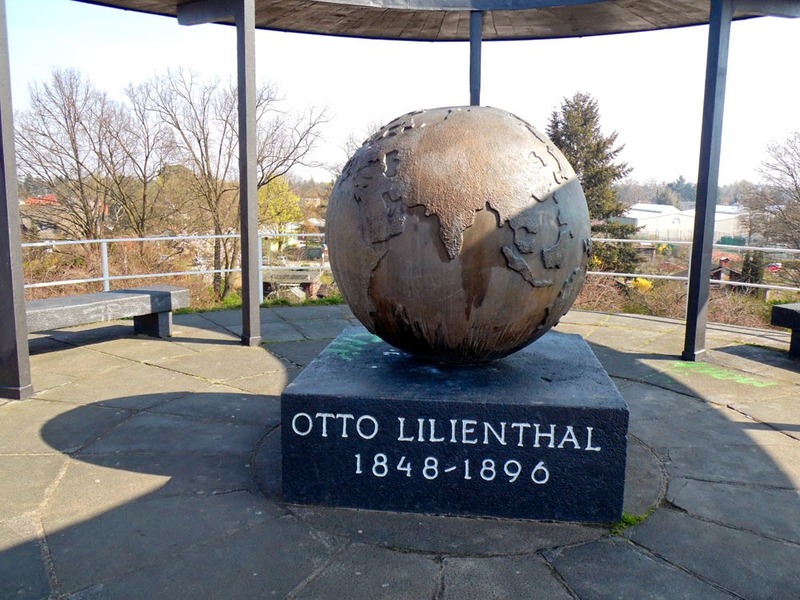 A better monument to Otto Lilienthal (and his brother and co-inventors) than Tegel Airport is to be found in the pleasant suburbs of Lichterfelde in the southern district of Berlin Steglitz-Zehlendorf. 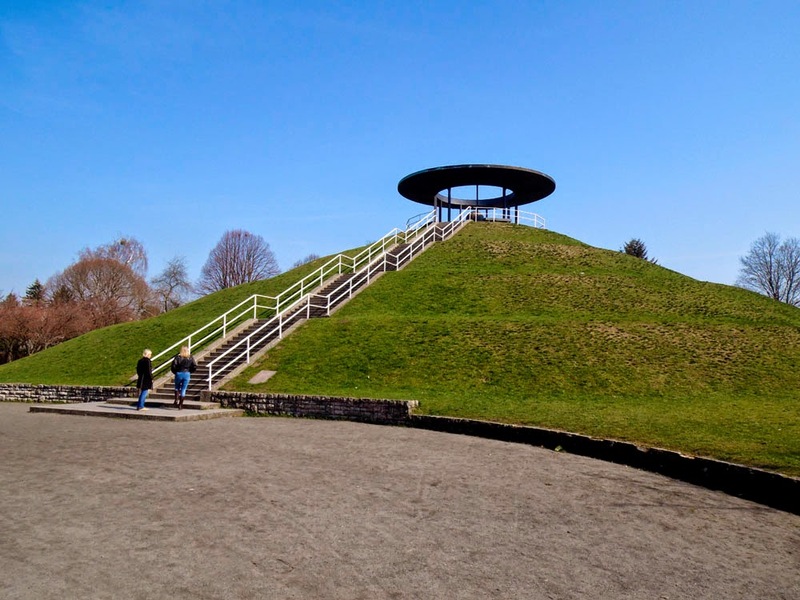 Situated in attractive parkland (named Lilenthalpark since the 1920's) stands a peculiar hill. It looks like a mini Silbury Hill or a large round barrow burial mound. 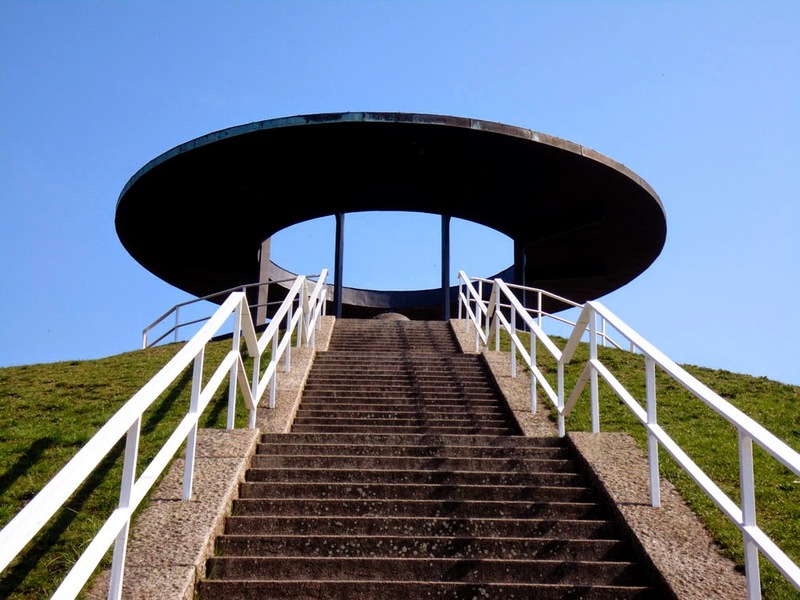 With its circular pavilion on the summit, it might even be a buried flying saucer. It looks artificial in the flat landscape because it is artificial. It was made from the waste, spoil and rubble produced by a brick-making factory that was located here at the time, next to a clay pit which has since been flooded and turned into a rectangular carp pool. In 1894 the Lilienthal brothers built a wooden shed on the summit 15m above ground-level to house their experimental gliders. They would regularly jump off the top of the hill with a glider, to the entertainment of crowds of curious onlookers. For this reason the hill was given the name Fliegerberg, or Aviator's Hill. The Fliegerberg was perfect for the brothers because, being round, they had a 360 degree arc of opportunity to push off into the wind, whatever direction it was blowing in. It was also at that time mostly open fields around the hill: nowadays it is surrounded by suburban houses. 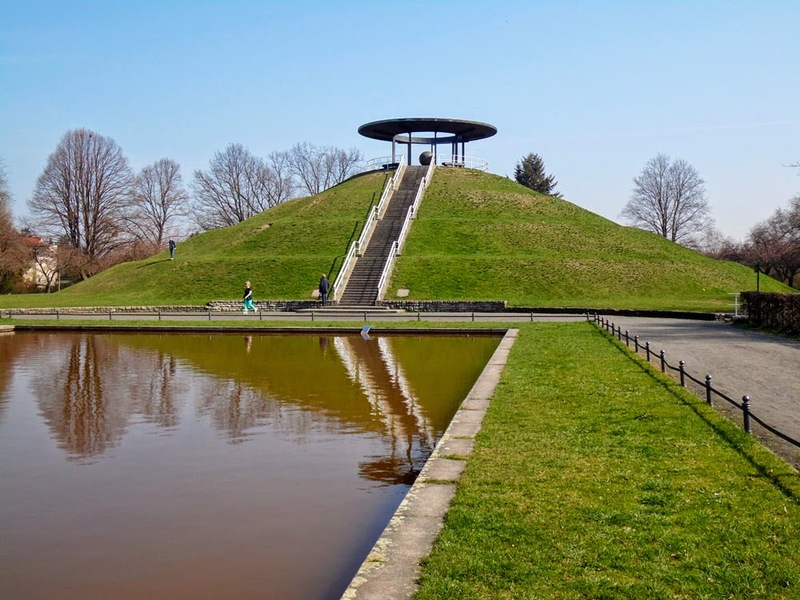 The Lilienthalpark was re-landscaped in 1930; the Fliegerberg was cleared of trees, the steps to the summit created, and the round portico and monument to Otto Lilienthal built on top. The memorial is of bronze on a block of basalt granite. The bronze globe was actually melted down during the Second World War to re-use the metal for shell-casings, and was replaced with a ball of stone in 1955. It was changed back to a bronze sphere in 1990. There was once a Museum zur Geschichte der Luftfahrt (museum to the history of aviation) here too, opened in 1961 but sadly closed down in 1975. 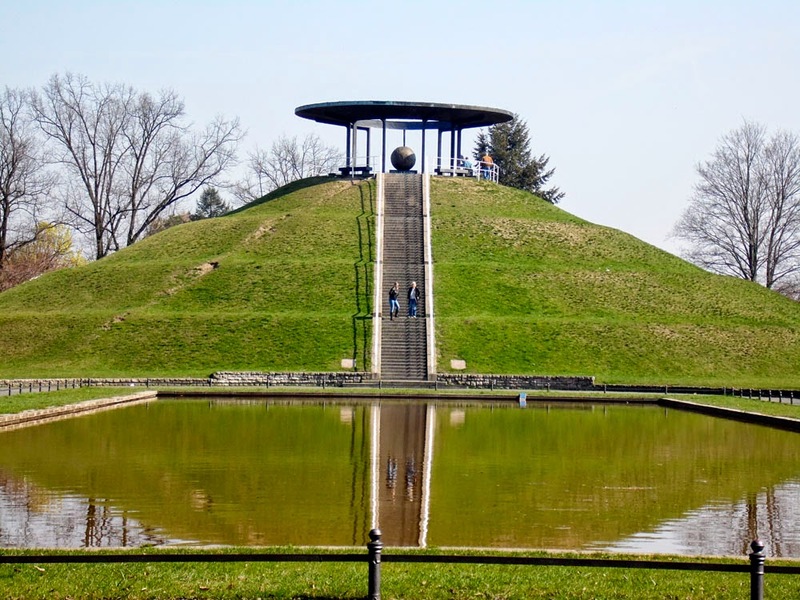 The Otto Lilienthal Denkmal is an interesting diversion - or at least a place to rest and eat your sandwiches - if you are doing the Berlin Wall Trail (Mauerweg), as the Fliegerberg is only 600m from the Berlin/Brandenburg (former West Germany / East Germany) border. 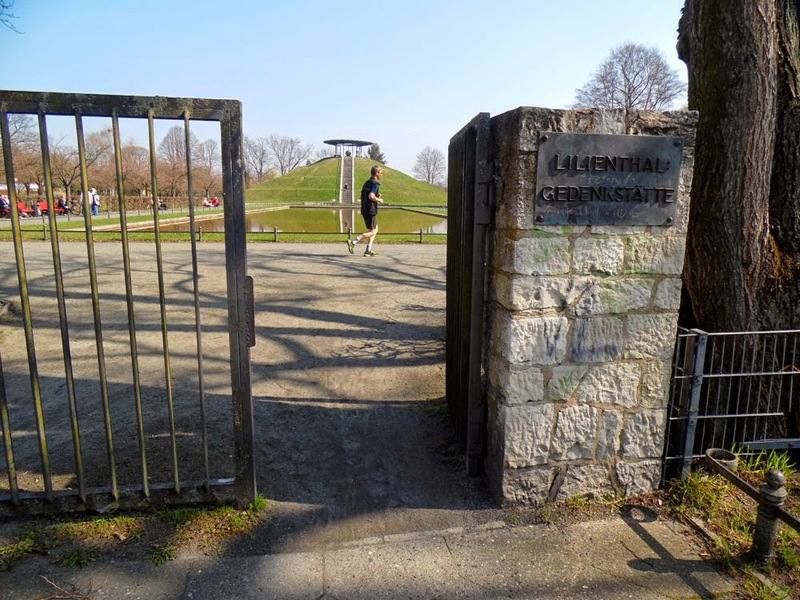 I don't think anyone ever tried to escape over the Berlin Wall by glider*, but then gliding off the hill over the Wall would have been a bit counter-productive: Lichterfelde was in West Germany already. And 600m is a long way to glide from an elevation of only 15m. OK, forget I said anything. "Eine Flugmaschine zu erfinden bedeutet wenig; sie zu bauen schon mehr; aber sie zu fliegen, das ist das Entscheidende"
I am glad that at least Gustav Lilienthal also gets a mention. *The museum Haus am Checkpoint Charlie does actually have a powered glider that was used by a man who escaped over the Czechoslovak-West Germany border. I also remember something about two Berliners who flew a microlight over to East Berlin to pick up their other brother and fly him back to the West. That isn't the same as gliding over the wall though.